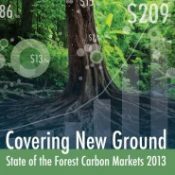 Covering New Ground, Ecosystem Marketplace’s new State of the Forest Carbon Markets report launched today in London. Among the findings in this year’s report include market growth by 9% and a growing interest from the business community in payment schemes that protect forests. Also in 2012, the amount of forest conserved by carbon finance grew to 26.5 million hectares. 5 November 2013 | Carbon finance supported the management of forests spanning 26.5 million hectares worldwide as businesses in 2012 injected a near-record $216 million into projects that plant trees, avoid deforestation, improve forest management and support low-carbon agriculture. Representing 162 projects in 58 countries, the report tracks forest carbon management over a land area larger than Ecuador. While market size grew 9%, the global average price for forestry offsets was $7.8/tonne – down from $9.2/tonne in 2011, but still higher than prices paid by voluntary buyers for other offset types ($5.9/tonne). Multinational corporations driven by responsible business ethics and a desire to show leadership on climate change bought two out of every three forestry offsets sold. The top buyer sectors ‒ energy, agriculture/forestry and transportation ‒ depend on forests’ ecosystem services (e.g. clean water) for their business, and some view investments forest carbon investments as a kind of insurance against direct exposure to climate risks. Industries in California and Australia also sought forest carbon offsets to prepare for domestic carbon regulations. While California’s compliance cap-and-trade market began this year, the future of Australia’s carbon price is uncertain, with new leadership pledging to ax the country’s carbon tax. Projects that reduce emissions from deforestation and degradation (“REDD”) saw heightened demand in 2012, as private companies like The Walt Disney Company and clothing brand Puma invested millions to support REDD projects in developing countries. A total of 8.6 million REDD offsets were transacted, tying with tree planting activities as 2012’s most popular project types. Projects that improve forest management climbed in popularity, while carbon finance for sustainable agriculture remained muted. Yet, the private sector and negotiators are increasingly attentive to agricultural carbon projects’ strong business case and benefits to avoided deforestation. Offset buyers strongly supported forest projects that deliver benefits beyond carbon sequestration, such as alternative local livelihoods and habitat protection for threatened species. Projects reporting community-held land tenure covered 13.7 million ha and were valued at more than $70 million, representing a particular interest in projects that benefit smallholders. Projects that actively monitored their social and environmental gains were behind 61% of offsets sold. Likewise, the market’s most popular third-party project standard, the Verified Carbon Standard, was rarely utilized without dual certification to the Climate, Community and Biodiversity Standards. The State of the Forest Carbon Markets 2013 is publicly and freely available thanks to support from the report’s Premium Sponsors: the Program on Forests (PROFOR), the World Bank Biocarbon Fund, Face the Future, and New Forests; Sponsors: Althelia Ecosphere and Baker & McKenzie; and additional support from the UK Forestry Commission’s Woodland Carbon Code – all of which enable Ecosystem Marketplace to explore developments on the frontier of ecosystem service finance.